Lisa Portelli, program director for Winter Park Health Foundation and BWCF board member, says she can walk into a meeting without anyone knowing she just trekked two or more miles in a hot and sticky Florida summer where daily thunderstorms are the norm, proving she has mastered the art of transitioning bike commuter apparel to professional dress in less than 10 minutes. “I ride make-up free, wipe down my body and face with an astringent, put on powder and lipstick and use a portable blow dryer to fix my hair in five minutes flat,” she said laughing hysterically. One may ask how and why. Try a backpack the size of a small child that packs a change of clothes and beauty supplies. It’s either a polyester dress or slacks for her, and professional-looking sandals that she can ride in but also complete a work outfit. Portelli shared a few lessons learned the hard way from transitioning to being a bike commuter over the past six months, such as not putting your backpack down in a sink that is sensor-activated or you will be blow drying your dress as well as your hair. For her, it is easier to bike day-after-day and have everything packed up, then switching between a briefcase and a backpack. Instead of a briefcase, she uses her backpack to hold an iPad for taking notes and places any documents or sensitive items in a 2-gallon Ziploc bag. Before leaving for a meeting, she is watching News 13 Weather on the Ones and during the meeting, checking the Weather Channel app. Dark clouds? If time allots, she will ride home to get her car or stay at the meeting location and work while waiting for the storm to pass. “The beauty of Central Florida weather is 9 times out of 10, it’s done raining before I get out of meetings,” she said. From biking to work, Portelli said she listens better, is more present and her memory has improved. She credits these improvements to taking time to reflect before and after the meeting. Portelli has worked her up way to riding her bike to work four days a week and uses the one other day for running errands. 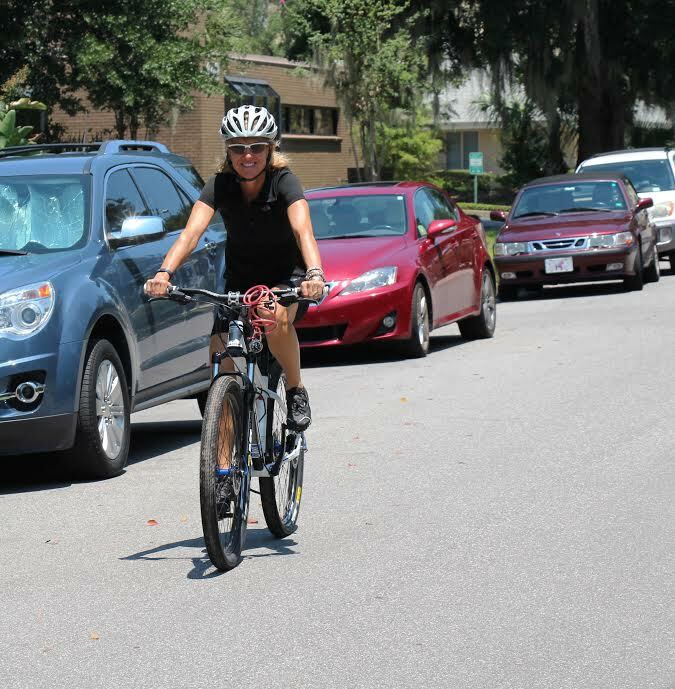 The advice she gives to those who have never biked on a Central Florida road is taking a bike-safety class, such as CyclingSavvy. For those who are comfortable riding on the road, she suggests riding the route on the weekend to plan out the safest route and to become familiar with the roads. So next time you see the blonde with a backpack riding her bike in work sandals, wave and think – if she can I do it, so can I.